Manchester United’s chase for Mats Hummels continue Manchester United are now the only side looking to secure the services of Borussia Dortmund centre-half Mats Hummels. 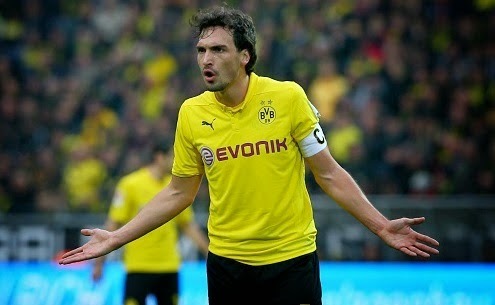 Manchester United are now the only side looking to secure the services of Borussia Dortmund centre-half Mats Hummels. Arsenal were the other side interested in his move in the past but with their recent signing of a centre-back Gabriel Paulista from Villarreal, the deal is likely to be in the court of the Red Devils. Arsenal boss Arsene Wenger was keen to sign Hummels but the price tag was way too high for the Frenchman which let him to sign other defender Paulista for a fee around £12million. The Brazilian will wear the number five jersey for the North London side. Hummels has been tipped several times to be a Red Devil since the summer, however injury problems and lack of seriousness from the Premier League side have never concluded the deal. But with now Arsenal taking a step back and Hummels set to leave the German side, United could finally give some good news to their fans. The Red Devils are yet to land any defender this month and the transfer window has now entered the final days. From Daily Star reports, United are also strongly targeting Dynamo Kyiv’s Aleksandar Dragovic who is likely to move to Old Trafford this month.